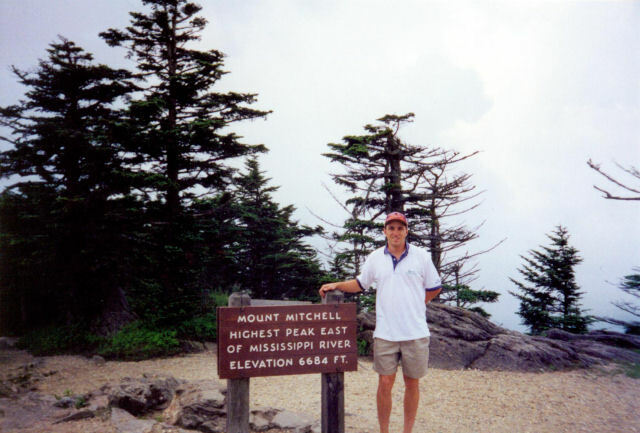 Mark on the summit of Mount Mitchell in Mount Mitchell State Park on 6/30/02. This is also the highest point east of the Mississippi river. I summited North Carolina on the way to backpack in the Smokies. The place is easy enough to find, but winds up being a chore as you have to spend a bunch of time on the Blue Ridge parkway. This is nice if you are there to site see, but not so nice if you are trying to hit another high point and make camp in the Smokies before dark. The hike to the summit is maybe a 1/4 mile and is amusing with all the park benches and old people sitting on them cluching their chests. There is a nice tower at the top where you can see 360 degrees all around, but of course the clouds obscured just about everything. I snapped the picture and headed off to Tennessee.